Before one of my college application essay writing workshops yesterday, I skimmed over some of the rough drafts the students had written last semester for their English classes. The writing was solid, the ideas strong. Yet the essays were all on the dull side. If only someone had taught these kids how to use anecdotes, I thought. They are the ultimate writing technique for Showing (an example) rather than Telling (explaining) about a point you want to make. Nothing powers a college application essay like an engaging anecdote in the introduction. Often, you can pull an anecdote ( a mini true story) out of what you’ve already written and instantly transform it into an engaging read. And it can be a very everyday, simple event or moment. I tried to think if anything of interest happened during our workshop to use as an example. In general, it was pretty uneventful, even (ahem) a bit boring. Then I remembered: The cat fell off the bookcase while I was talking. It had fallen asleep and slipped off. We all had a good laugh. So something did happen. Now, how would I write that as an anecdote? Is it possible to take such a mundane event like that and turn it into a mini-story? Let’s see. The trick to anecdotes is to gather some details. Myself, five students and a cat. It fell off because it went to sleep and slid off. Next, gather the sensory details to try to re-create the scene or setting. What did we see, hear, smell, feel, touch or sense? I didn’t see it fall since it was lying behind me. I heard a soft thud. I heard the students’ exclamation of surprise. I didn’t touch or smell anything. I find it helps to start with the “where,” and then put yourself into the picture as well. Standing by the window? Sitting on the grass? Where were you when the incident or event happened—for point of view. Remember, I was sitting with my back to the sleeping cat. My students watched it happen. Here’s how I would write an anecdote about this moment. It took me a couple attempts. I wrote it out, then took out words I didn’t need or want, moved sentences around, shortened some sentences, added a phrase to another. I read it aloud each time. I tried to vary sentence lengths between short and long, sticking more with the shorter sentences. I tried to think of this little moment visually—what it would have looked like as a piece of video. I tried to start as close to the peak of the action as possible and still have the event make sense with some background. Notice that I spend barely any time leading up to what happened. I had been talking for nearly an hour straight. My five writing students, all seated around a large table in front of me, were starting to fidget. Suddenly, I heard a soft thump and a commotion behind me. The students also jumped up in unison. “What the heck?” I said as I craned my neck behind me. Everyone started laughing. The 16-year-old black cat, Ace, had fallen asleep on the bookshelf behind us and gradually slipped over the edge until he abruptly dropped to the floor. As the students laughed, we all watched Ace shake his head a couple times, stunned from the impact, trying to brush off the rude awakening. Then he padded into the next room as though nothing had happened. I couldn’t help but think later how it took a sleeping cat to wake everyone up. I know this isn’t great writing or the most compelling anecdote you’ve ever read. But notice how it’s easy to read and keeps you moving forward. Why? Because something happened, and you want to know why and what happens next. I also want you to see how to take the most simple event or moment and turn it into an engaging anecdote, simply by relating the details of what happened in a direct manner. There were countless other ways to describe this same moment, and that’s the beauty of an anecdote. It’s all in the telling, what details you share and what you want to emphasize. If you want to practice your narrative writing skills, try crafting a couple anecdotes out of everyday incidents in your life. They don’t need to be super exciting or impressive. Just think of something that happened, say, when you were at the beach, or at a bookstore, or at the yogurt shop. Describe a brief interaction you had with someone in line with you, or an exchange between a mother and child. These take a little practice. Remember, anecdotes are one of the most powerful writing techniques you can learn. 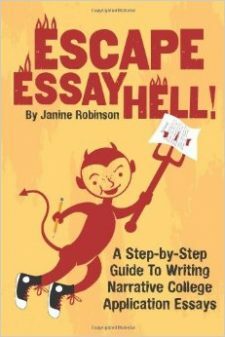 And they are solid gold when it comes to writing your college admissions essay! This really helped. Anecdotes have not really come easy to me, mainly because I can’t think of any cool story that truly happened, or there was never any. But now I’m able to create anecdotes out of anything! An anecdote can be an antidote to poor writing. You are delightfully clear and concise with this post. Anecdotes are my favorite when it comes to public communication through writing and/or public speaking. Thanks for sharing.